The United Nations Memorial Cemetery (UNMCK; Hangul: 재한유엔기념공원; RR: jae hahn UN ki nyum gong won), located at Tanggok in the Nam District, City of Busan,[nb 2] Republic of Korea, is a burial ground for United Nations Command (UNC) casualties of the Korean War. [nb 3] It contains 2,300 graves and is the only United Nations cemetery in the world. Laid out over 14 hectares (35 acres), the graves are set out in 22 sites designated by the nationalities of the buried servicemembers. The Korean War began when North Korean People's Army forces attacked south in June 1950. As the fighting progressed, temporary military cemeteries for battle casualties were established by United Nations forces near the towns of Taejon (July 9, 1950), Kwan-ui (Kwan-ni), Kum-chon, and Sindong. When the North Korean forces pushed towards Pusan, these cemeteries had to be abandoned. 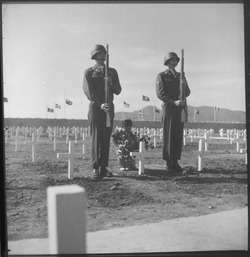 Later, as the Battle of Pusan Perimeter developed, temporary cemeteries were established at Masan, Miryang, and Taegu, with a Pusan cemetery being established on July 11, 1950. As the fighting pushed into North Korea, temporary cemeteries were established in or near the towns of Kaesong, Sukehon, Wonsan, Pupchong (Pukchong County), Yudarn-ni and Koto-ri. Some 11 division-level cemeteries were established in the first two months of fighting and later 5 UN military cemeteries were established in North Korea. At the beginning of the war, the nearest U.S. Army mortuary affairs unit was the 108th Graves Registration Platoon in Yokohama, Japan, which was searching for the remains of missing World War II American airmen. The 108th was reconfigured as the 114th Graves Registration Company and deployed to establish temporary cemeteries at Hungnam, Pyongyang, and Suchon as the fighting continued. Supporting the 2nd Infantry Division was the Graves Registration Section of the 2nd Quartermaster Company, which collected the remains of Allied and American soldiers to be further processed by the 148th Graves Registration Company. When UN forces launched the Inchon Invasion in September 1950, a platoon from the 565th Graves Registration Company accompanied them. Other mortuary affairs units included the 293rd Graves Registration Company, activated in April 1951. It was difficult to recover remains and conduct burials in Korea, due to the rugged geography and harsh climate, and the threat of unexploded ordnance and booby-traps. Construction of the United Nations Military Cemetery (UNMC) at Tanggok began on January 18, 1951 and was carried out by hand-labor over a 28.2 hectares (70 acres) site. It was dedicated by General Matthew Ridgeway on April 6, 1951. Graves Registration units then concentrated American and allied remains at Tanggok before they were permanently buried or repatriated. Besides burial services, refrigeration units to store remains were added, as were cremation facilities. Today the 2,300 graves in the cemetery are set out in 22 sites designated by the nationalities of the buried service members. Following the signing of the Korean Armistice Agreement in July 1953, the United Nations Command sought to recover bodies interred in North Korean territory. Cemeteries for POWs in North Korea were established at 16 POW camps. From September to October 1954, the resulting exchange of casualties, dubbed Operation Glory, between United Nations forces and the North Koreans resulted in 4,219 remains being recovered, of which 1,275 were non-US casualties. (Also exchanged were the remains of approximately 14,000 North Korean and Chinese casualties.) From 1950 to 1954, approximately 11,000 casualties were interred at UNMC, which was maintained by the United States Army Graves Registration Agency. It was officially established as the United Nations Memorial Cemetery on December 15, 1955 with the passage of UN General Assembly Resolution 977(X). Following the war, the cemetery was funded from the United Nations budget, but the Sino-Soviet world objected to this funding. In 1973, the cemetery was transferred from the UN to the Commission for the United Nations Memorial Cemetery (CUNMCK), which is composed of representatives from the 11 countries who have servicemembers buried there. The cemetery is designated as Site 359 in the listing of Registered Cultural Heritage Sites in Korea by the Cultural Heritage Administration of Korea. Also, it is a visitor attraction for Pacific Rim tourists. In 2011, United Nations Secretary-General Ban Ki-Moon described it as the only United Nations cemetery in the world. April 1951 – a Korean girl places a wreath of flowers while an honour guard present arms at the United Nations cemetery in Pusan. An Honour Guard from the Republic of Korea 53rd Division carries out flag ceremonies daily. The Wall of Remembrance, completed in 2006, has the names of the 40,896 United Nations casualties (killed and missing) inscribed on 140 marble panels. The UNMCK maintains a website in Korean, English, and Turkish (Türkçe), which allows website visitors to post online flowers and tributary messages. The cemetery contains the graves of 2,289 military personnel and 11 non-combatants. Amongst those are the graves of Bill Madden GC, 3rd Battalion, Royal Australian Regiment, (who died as a prisoner of war), Kenneth Muir VC (killed in action in the Battle of Hill 282 while serving with the Argyll and Sutherland Highlanders), and Philip Curtis VC (killed in action in the Battle of the Imjin River while serving with The Duke of Cornwall's Light Infantry). Also buried is Lt. Col. Charles Hercules Green DSO, commander of the 3rd Battalion, Royal Australian Regiment, who was mortally wounded at Battle of Chongju and died at nearby Anju. Dutch Lt. Col. Marinus Petrus Antonius den Ouden, commander of the Regiment Van Heutsz, was killed in action during Operation Roundup in 1951 and is buried with members of his regiment – posthumously, den Ouden was awarded Netherlands' highest military award, the Military Order of William. In the early days of the war, journalist Christopher Buckley died from a land mine explosion, and was subsequently buried at the cemetery. ↑ Post-war deaths only – with the exception of 4 symbolic unknowns, all recovered remains were repatriated. ↑ As a transliteration from Korean, the city name 부산 (Korean pronunciation: [pusʰan]) was typically spelled "Pusan" in McCune-Reischauer until 2000. The official Revised Romanization spells the name Busan. See "Pusan: South Korea". Geographical Names. Retrieved August 15, 2011. ↑ The Korean War started on June 25, 1950 when North Korean forces pushed south of the 38th parallel which divided Korea following World War II. With authorization from the United Nations, forces from the United States and other nations pushed the North Koreans back to the north. When these UN forces approached China, Chinese forces intervened and the battlefront eventually stabilized along the 38th parallel. The Korean Armistice was signed on July 27, 1953 to end the fighting. Cemetery for North Korean and Chinese Soldiers, established in Paju, South Korea. ↑ Korean War casualties only. In 2012, the cremated remains of Archie Hearsay were buried with his brother, Joseph, who had died in Korea while both were serving. See: "Ashes of Canadian veteran buried beside brother in S. Korea". TBNewsWatch (Dougall Media). The Canadian Press. April 25, 2012. ↑ Brent, Winston A. (2001). 2 Squadron in Korea: Flying Cheetahs 1950–1953. Nelspruit: Freeworld Publications. p. 134. ISBN 978-0-9583880-9-2. OCLC 174758735. ↑ "Turkish Fallen of Korean War Remembered". Diplomatic Observer. Ankara: Över Publishing. 2002. ↑ Balkenende, Jan Peter (Prime Minister of the Netherlands) (April 29, 2010). "Speech at the United Nations Memorial Cemetery in Busan". Documents and publications. Government of the Netherlands. 1 2 Dickon, Chris (2011). The Foreign Burial of American War Dead: A History. Jefferson, NC: McFarland & Co. pp. 138, 141. ISBN 978-0-7864-4612-4. OCLC 659753667. ↑ Reportedly of North Koreans who refused to be repatriated following the war because they had criticized the regime. See: Baldwin, R F (2013) . Seven Years in Asia: A Wander's Tale. Booksmango. p. 278. ISBN 978-616-245-096-9. OCLC 781689455. ↑ Some unidentified Americans were left as token representatives to the unknowns. Pash, Melinda L. (2012). In the Shadow of the Greatest Generation: the Americans who fought the Korean War. New York and London: New York University. p. 134. ISBN 978-0-8147-6769-6. OCLC 777627052. 1 2 3 4 5 6 Clark, Donald N. (September 1996). "Part III: Smaller Foreign Cemeteries in the Provinces" (PDF). The Seoul Foreigners' Cemetery at Yanghwajin. Seoul, Korea: Seoul Union Church. p. 78. 1 2 3 4 Cook, James C. (March–April 1953). "Graves Registration in the Korean Conflict". The Quartermaster Review. Fort Lee, VA: Army Quartermaster Museum. 1 2 3 4 5 Coleman, Bradley Lynn (January 2008). "Recovering the Korean War Dead, 1950–1958: Graves Registration, Forensic Anthropology, and Wartime Memorialization". The Journal of Military History. Project Muse (Society for Military History). 72 (1): 179–222. doi:10.1353/jmh.2008.0013. ISSN 0899-3718. ↑ Cannon, Florence (May–June 1952). "Our Honored Dead". The Quartermaster Review. United States Quartermaster Museum & The Memorial Day Foundation. [After July 1950], reports of burials were received from cemeteries in the Miryang, Taegu, Kaesong, Pyongyang, Sukehon, Wonsan, Pupchong, Hungnam, Yudarn, Koto-ri and Tanggok areas. ↑ Anders, Steven E. (September 1988). "With All Due Honors: A History of the Quartermaster Graves Registration Mission". Quartermaster Professional Bulletin. ↑ "POW March Routes and United Nations Cemeteries [map]". Defense POW/Missing Personnel Office. 1 2 Potter, Constance; Deeben, John (2010). "67: Care for the Military Dead". In Bradford, James C. A Companion to American Military History, Vol II. Wiley-Blackwell. p. 1039. ISBN 978-1-4051-6149-7. OCLC 316098909. ↑ The only other American active duty graves registration unit was at Ft. Bragg, North Carolina. Becker, James R. (2004). "United States Culture and Its Effects on Military Policy Regarding Mortuary Affairs". Ft. Leavenworth, KS: US Army Command and General Staff College. ↑ Alexander, Bevin R. (1951). "Quartermaster Field Service Platoon in Action". Combat Support in Korea. U.S. Army Center of Military History. ↑ Sledge, Michael (2007) . Soldier Dead: How We Recover, Identify, Bury, and Honor Our Military Fallen. New York: Columbia University Press. pp. 40–41, 58, 80, 190. ISBN 978-0-231-50937-4. OCLC 60527603. 1 2 3 Keene, Judith (February 2010). "Below Ground: The Treatment of American Remains from the Korean War". The Public Historian. National Council on Public History. 32 (1): 58–78. doi:10.1525/tph.2010.32.1.59. ISSN 0272-3433. JSTOR 10.1525/tph.2010.32.1.59. ↑ "UN Memorial Cemetery". The 60th Anniversary of the Korean War Commemoration Committee. Archived from the original on June 15, 2013. ↑ Casualties from the Colombia Battalion were cremated at Tanggok by the American Graves Registration Service and then repatriated to Colombia in 1954. Coleman, Bradley Lynn (October 2005). "The Colombian Army in Korea, 1950–1954" (PDF). The Journal of Military History. Project Muse (Society for Military History). 69 (4): 1166–1167. doi:10.1353/jmh.2005.0215. ISSN 0899-3718. ↑ "Major Remains Concentrations in North Korea" (PDF). Defense POW/Missing Personnel Office. ; "POW March Routes and U.N. Cemeteries" (PDF). Defense POW/Missing Personnel Office. ↑ "Major Remains Concentrations in North Korea [map]". Defense POW/Missing Personnel Office. ↑ "Operation GLORY: Historical Summary". Condensed from Graves Registration Division, Korean Communications Zone (KCOMZ). Fort Lee, VA: Army Quartermaster Museum. Jul–Dec 2004. Note: the calculation of remains comes from Coleman as the "Historical Summary" gives a total of 4,023 UN remains received. ↑ Cole, Paul M. (1994). "Three: Efforts to Recover and Account for Korean War Casualties". POW/MIA Issues Volume 1, The Korean War (PDF). Santa Monica, CA: National Defense Research Institute. p. 68. ISBN 978-0-8330-1482-5. OCLC 855303293. ↑ Nahm, Andrew W.; Hoare, James E. (2004). Historical Dictionary of the Republic of Korea. Lantham, MD: Scarecrow Press. p. 173. ISBN 0-8108-4949-6. OCLC 54081516. ↑ Department of External Affairs (1956). "Conference Series: Canada and the United Nations". Ottawa: 15. ↑ Gareau, Frederick H. (June 1972). "The Soviet Bloc and the United Nations System: the Quantitative Record". Political Research Quarterly. 25 (2): 268–94. doi:10.1177/106591297202500209. ↑ Lee, Chae-Jin; Park, Doo-Bok (1996). China and Korea: Dynamic Relations. Stanford, CA: Hoover Press. p. 116. ISBN 978-0-8179-9421-1. OCLC 34151310. ↑ "Cemeteries overseas". Korean War. Australia Department of Veterans' Affairs. September 30, 2012. 1 2 "UN Commemoration Park in Korea". Registered Cultural Heritage Site 359. Cultural Heritage Administration of Korea. ↑ Hutchinson, Garrie (2006). Pilgrimage: A Traveler's Guide to Australia's Battlefields. Melbourne: Black Inc. p. 384. ISBN 978-1-86395-387-0. OCLC 234310738. ↑ Hall, Colin Michael (1994). Tourism in the Pacific Rim: Development, Impacts, and Markets. Melbourne: Longman Cheshire. p. 48. ISBN 978-0-470-23375-7. OCLC 258617555. 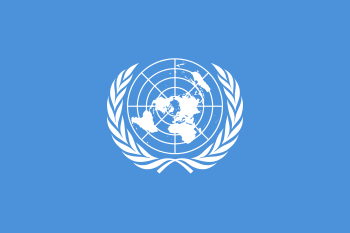 ↑ Ban, Ki-Moon (November 30, 2011). "Remarks at UN Memorial Cemetery in Korea [as delivered]". Ban Ki-Moon's speeches. UN News Center. ↑ "Korea Vet News". Korean War Commemoration Council of Canada. 1 2 "UN Sculpture Park". UNMCK. Republic of South Africa Embassy. 1 2 "Remembering the Korean War". Ministry Stories. Defence Anglicans. 2013. Retrieved November 9, 2013. ↑ "Monument to Canadian Fallen (Korean War Monument)". Public Art and Monuments. Canadian Heritage, Government of Canada. October 25, 2013. ↑ "Canadian Korean War Veterans Participate in a Remembrance Ceremony at the United Nations Memorial Cemetery in the Republic of Korea". PR Newswire. July 28, 2013. [T]he names of the 516 Canadian soldiers who died ... are written on the Wall of Remembrance. ↑ Summers, Julie (2010). "Commemoration of the War Dead Since 1945". British and Commonwealth War Cemeteries. Oxford, UK: Shire Publications. p. 50. ISBN 978-0-7478-0789-6. OCLC 462882226. ↑ "New Zealand Memorial in Korea". National monuments & war graves. NZ Identity & Heritage. February 19, 2013. ↑ "Veterans To Attend Korean War Armistice Commemoration". Media Releases. New Zealand Defence Force. June 2013. ↑ Quisefit, Laurent (November 5, 2013). "The French Participation in the Korean War and the Establishment of a 'Path of Memory' in South Korea". Societies. 3 (4): 427–444. doi:10.3390/soc3040427. ISSN 2075-4698. ↑ "Vice Minister [Foreign Affairs, Torgeir Larsen] Visits United Nations Memorial Cemetery in Korea". The Royal Norwegian Embassy in Seoul. October 4, 2013. ↑ "Bilateral Relations: Military cooperation". Royal Thai Embassy, Seoul. May 2, 2013. ↑ "South Koreans, allies pay tribute to Turkish war effort". Daily News. Pakistan Defence. June 27, 2010. ↑ "Dedication of the U.S. Korean War Memorial in Busan, South Korea on July 28". Events:. American Battle Monuments Commission. July 22, 2013. This is the third memorial commemorating the Korean War created by ABMC. ↑ Delcore, David. "Barre granite is new, unique memorial in South Korea". Vermont Today. Rutland Herald. ↑ "Major Muir, K.". UN Memorial Cemetery, Korea. ↑ "Lt. Curtis, P.K.E.". UN Memorial Cemetery, Korea. ↑ "Lt. Col. Green, Charles Hercules". UN Memorial Cemetery, Korea. ↑ "Lt. Kol. Cdt. Ouden, M.P.A. den". UN Memorial Cemetery, Korea. ↑ "Mr. Buckley, C.". UN Memorial Cemetery, Korea. Martz, Jr., John D. (May–June 1954). "Homeward Bound". Quartermaster Review. Fort Lee, VA: US Army Quartermaster Foundation. A description of the post-interment processing of casualties undertaken at Kokura, Japan, in which they were identified and prepared for repatriation. United Nations Memorial Cemetery in Korea. Records, 1959–1974. OCLC 86160340.